Nothing beats the silky clean feeling of freshly washed hair, lightweight and full of bounce. Now, you can have that refreshing experience on the go, without having to hit the shower. 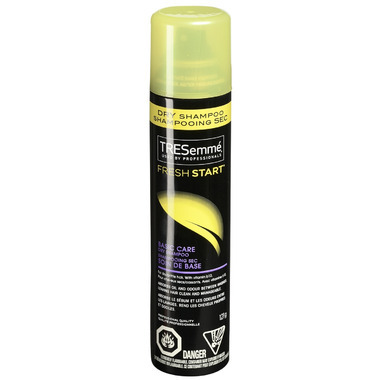 Second day hair no longer has to be limp or lacklustre thanks to TRESemmé® Fresh Start® Basic Care Dry Shampoo. Beat oily hair in seconds flat when you’re between washes to achieve a fresh look and feel. And the convenient size of the Trial & Travel dry shampoo means you can pop it in your purse and use it anywhere. his volumizing dry shampoo restores hair anywhere, in no time flat. How to revive second day hair to achieve lustrous locks: Shake Tresemme dry shampoo vigorously before using, and in between sprays. Lift sections of dry hair and spray lightly at the roots in short bursts, holding the canister 2 - 25 cm from your head. Brush out hair, and style as usual. Ingredients: Isobutane, Propane, SD Alcohol 40-B (Alcohol Denat. ), Aluminum Starch Octenylsuccinate, Butane, Citrus Grandis (Grapefruit) Fruit Extract, Citrus Tangerina (Tangerine) Peel, Hydrolyzed Keratin, Cyanocobalamin, Isopropyl Myristate, Silica, Fragrance (Parfum).